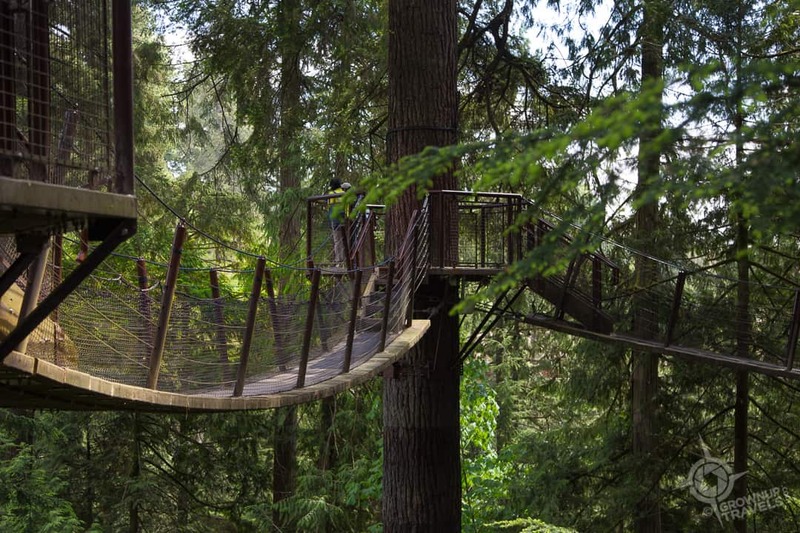 Capilano Suspension Bridge Park is all Grown Up! 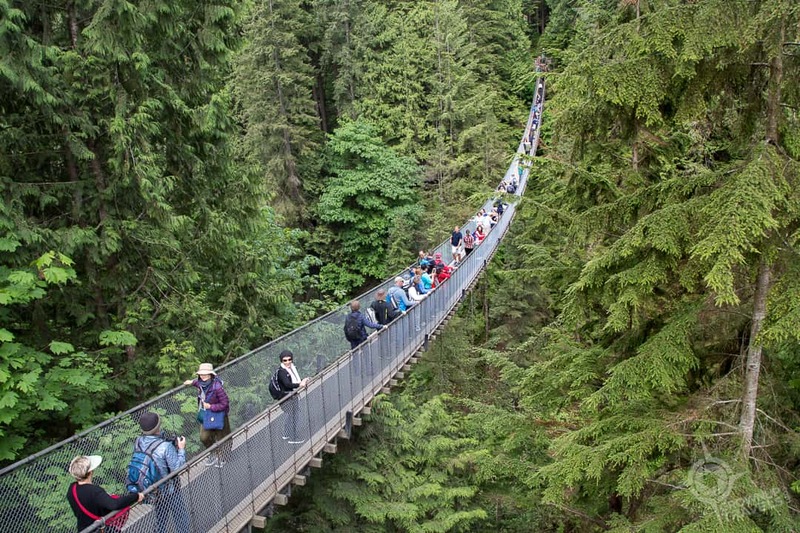 It’s been almost 20 years since I first visited the Capilano Suspension Bridge Park, and all I remember was crossing the wobbly, 450-foot long foot bridge with a handful of other visitors and walking around the relatively untrodden old-growth forest on the opposite side. Well, needless to say, a recent visit showed me that things have changed in the two decades and the Park has certainly grown up. 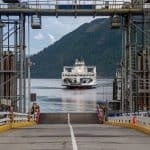 It is now BC’s top destination attraction, and while the suspension bridge after which it is named is still a must-see feature, there is now much more to see and do here. 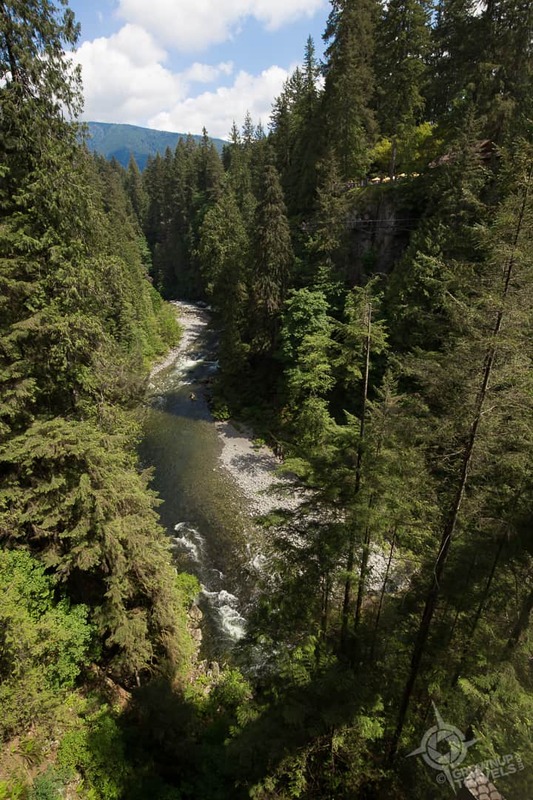 It all started in 1888 when George Grant Mackay constructed a hemp and cedar bridge to connect the 6,000 acres he purchased on both sides of the Capilano River. 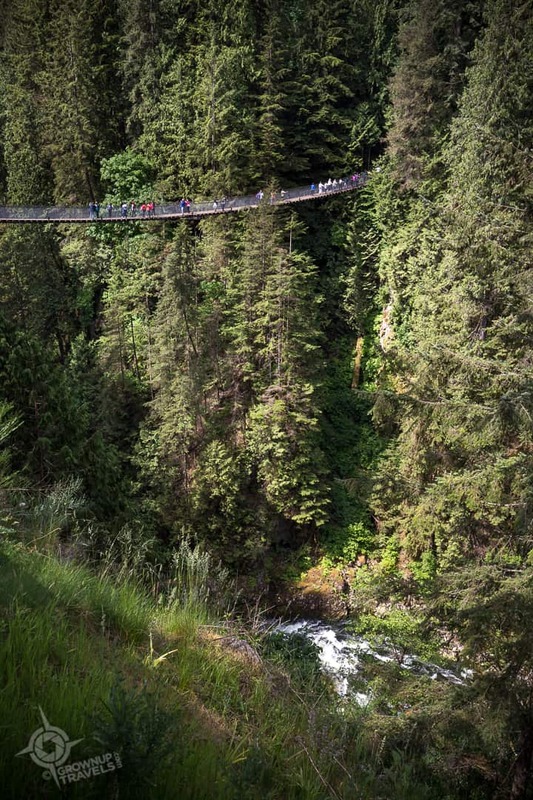 One hundred and thirty years later, during which time the bridge was rebuilt 3 times, Capilano Suspension Bridge Park has become once of Vancouver’s – and the province’s – top attractions. 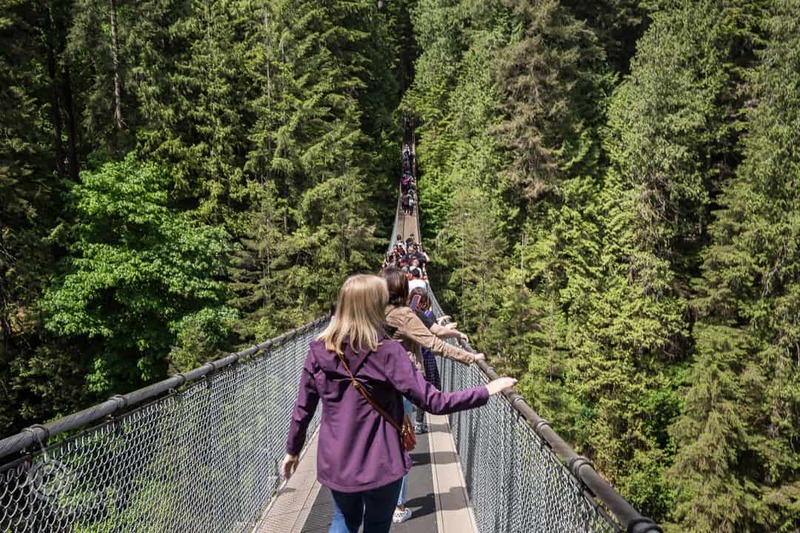 Of course, with this popularity comes a lot more traffic, and crossing the Capilano suspension bridge today is like taking an on-ramp onto a pedestrian highway. But even with the crowds that flock here, the walk across the swaying bridge is something that still impresses visitors and can really intimidate those with a fear of heights. In fact, Henk and I watched several people start across and turn back within about 20 feet, as they felt the swaying platform rock and tilt under their feet, and many of those who did cross the entire stretch of bridge had a death grip on the handrails the whole time. 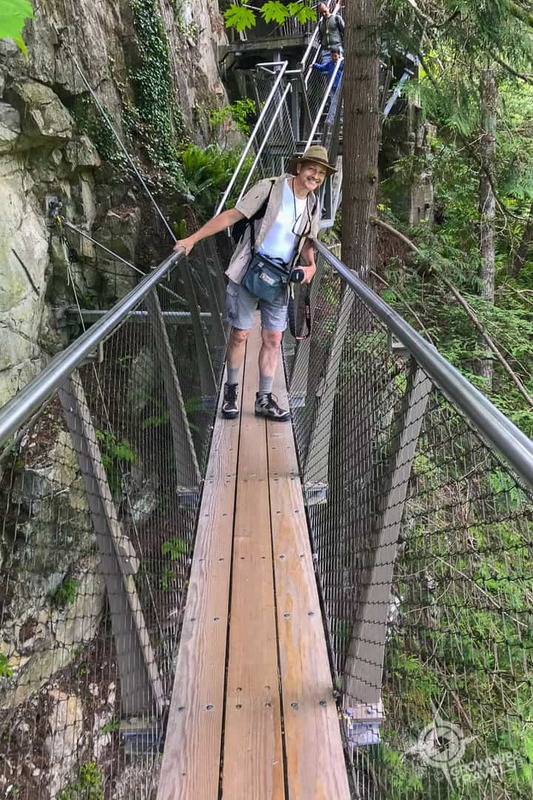 Even with his fear of heights, Henk was a trooper, and made it across with no difficulty, even stopping to take photos mid-way, since one of the rewards of being on the bridge is the amazing view of the river gorge that it spans more than 230 feet below. TIP: To avoid the worst crowds, arrive at the Park first thing in the morning, preferably on a weekday. Try to avoid days when there are multiple cruise ships in Vancouver’s harbour as this is a popular daytrip for cruisers. Check the port schedule here. Capilano Suspension Bridge Park had more surprises in store for me on the opposite side of the suspension bridge: instead of a few paths through the trees that I remembered, there is now a well-developed network of boardwalks and trails throughout the forest. 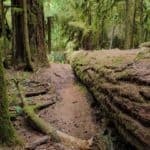 These trails do two things, first allowing visitors to do self-guided walks past some of the tallest old-growth trees in the park (like “Grandma Capilano”), and secondly helping to limit the impact of all that foot traffic on the forest itself. 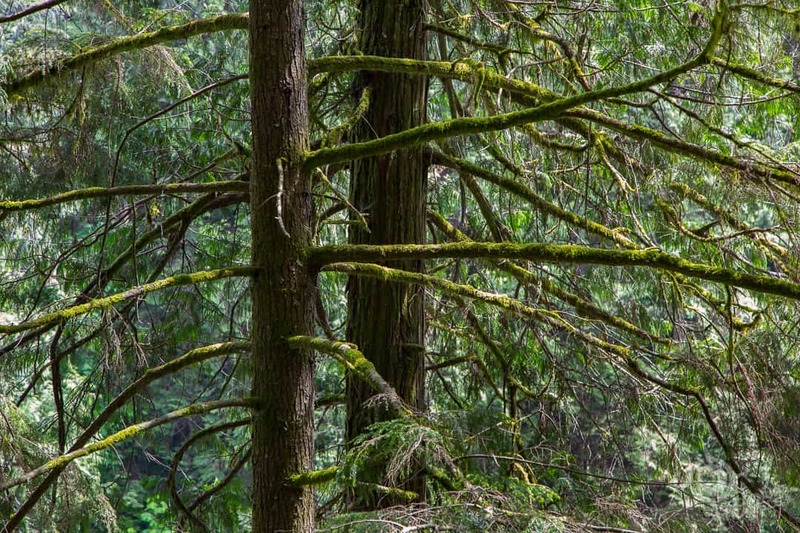 Grandma Capilano is about 1300 years old and over 250 feet tall! There are small ponds stocked with rainbow trout spanned by picturesque bridges, and a Nature’s Edge trail that runs alongside the gorge which gives people a different view of the suspension bridge. Even with all the visitors, there’s still the chance to see wildlife – we spotted 2 raccoons on the ground and in the trees which the park staff made sure weren’t disturbed by curious onlookers. 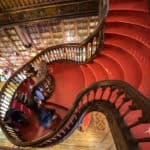 TIP: If you prefer an expert to take you around, the Park offers free guided history and nature tours that leave hourly (more frequently in high season). Check at the Park entrance for tour times. 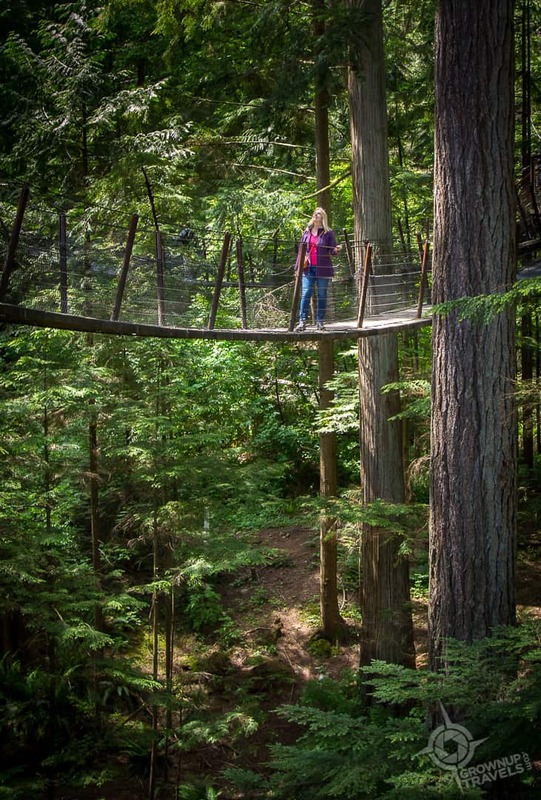 The forest trails are beautiful, but my favourite addition to the Park is a network of trails ABOVE the forest floor called the Capilano TreeTops Adventure: a circuit of 7 overhead walkways that allow visitors to stroll between the forest’s massive Douglas Firs and enjoy the surrounding tree canopy at eye-level. Careful construction of the suspended walkways means no trees are damaged and it’s great fun to stroll through the forest several stories above the ground, whether you are a kid or a grownup. And since your admission to the park covers all the activities within it, you can do the circuit as many times as you like, or just hang around in the canopy for as long as you want. Henk was all in – sorta kinda. 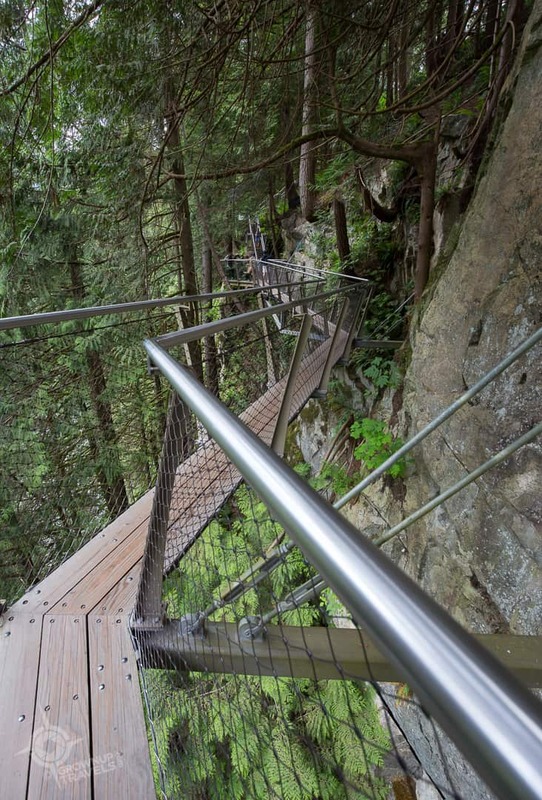 The Cliffwalk begins with a series of metal and wood stairways that hug the granite cliff face of the gorge. 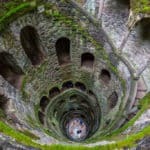 These stairways descend to the real star of the path, a semi-circular suspended ‘bridge’ that arches 20 feet or so away from the sheer rock wall anchoring it. With its glass sides and only a a few discreet metal ribs visibly connecting you to the rock wall, you do feel like you are suspended over the gorge, with nothing between you and the river below except trees and space. Fortunately for Henk, the walkway itself isn’t glass, or I’m not so sure he would have ventured out. After the arched walkout, the Cliffwalk continues along the rock wall, taking you across stretches where there is nothing but trees below. 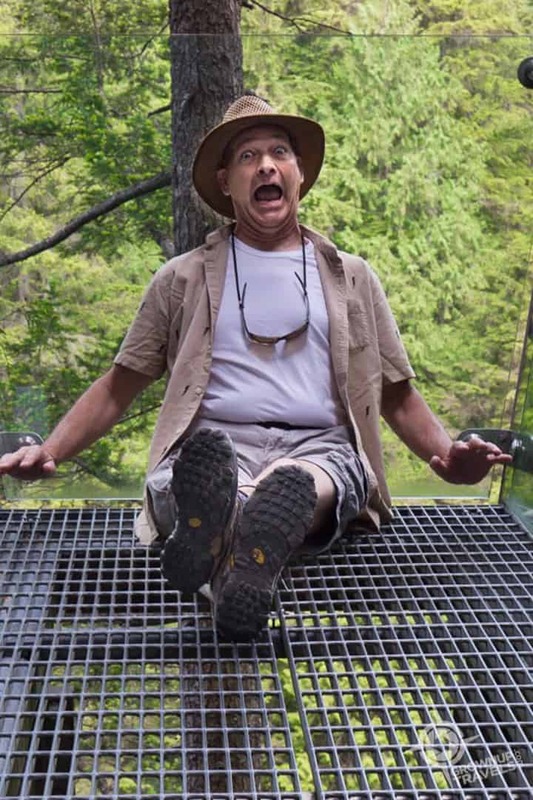 Just as you begin climbing back to the top of the cliff, you’ll find another platform that juts out into the forest giving visitors a different view of the river – and a great opportunity to ham it up for the camera. 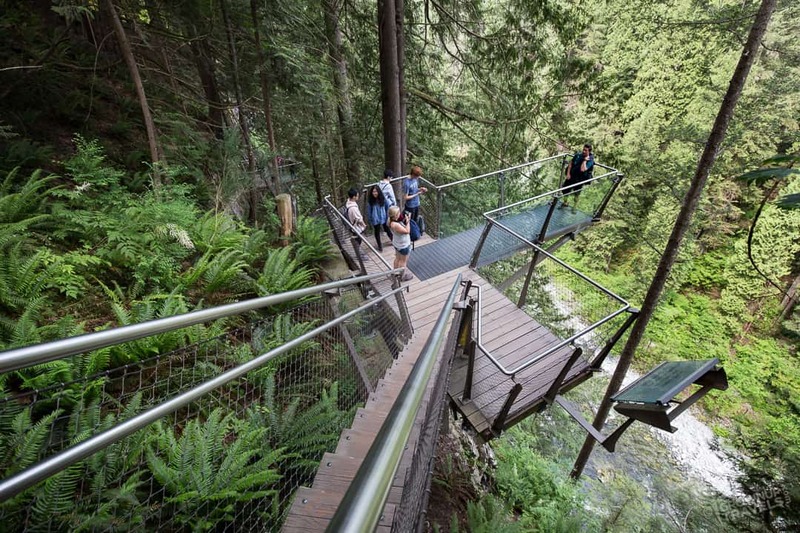 TIP: Be sure to keep a good grasp on your phone along the Cliffwalk walkway or your visit to Capilano Park will cost you more than the $47 entrance fee! 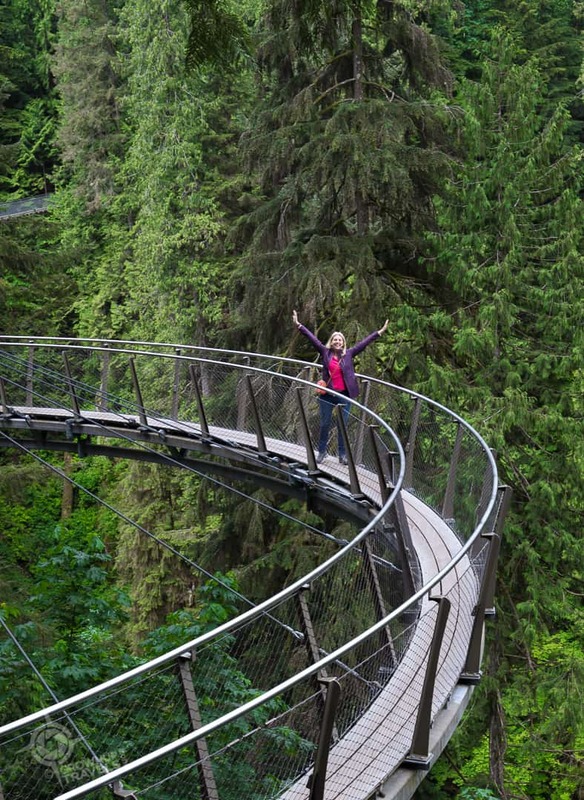 You really can spend hours in Capilano Suspension Bridge Park, especially if you make it your mission to stamp every activity on the Park Passport that guests are given. 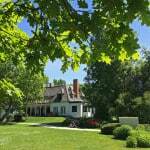 Beyond the beautiful nature walks and adventures, there is a lot of history here which is presented in the with photos and memorabilia in the Park’s Story Centre. The Kia’palano interpretation centre describes the indigenous connection to this area that goes back 8000 years. (Kia’palano means ‘Beautiful River’ and was the name of the Squamish chief who lived here in the early 1800s). 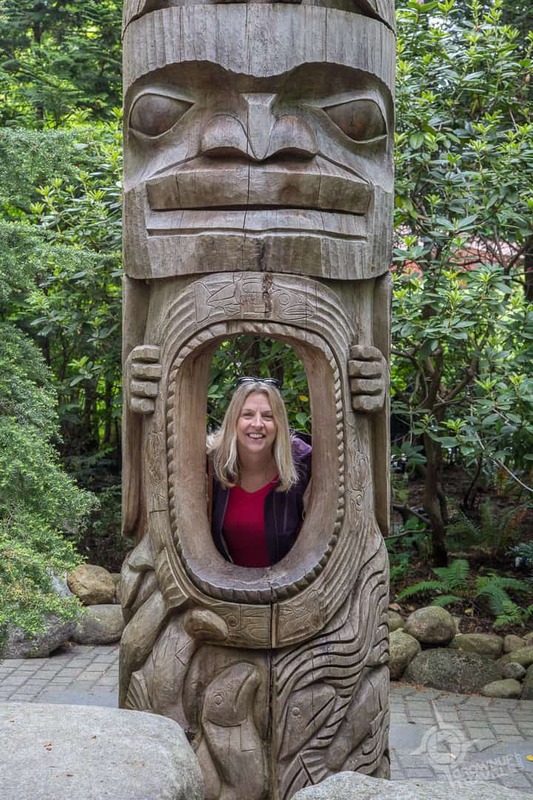 Capilano Suspension Bridge Park has the largest collection of privately owned totem poles in North America, and you can view many of them on the site near the entrance. 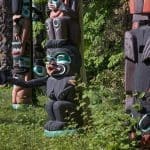 The collection was started in 1934 when Archibald MacEachran, the owner of the property at the time, invited local indigenous artisans to come and carve at the park and display their work, including Mathias Joe Capilano, a descendant of the original Squamish chief. 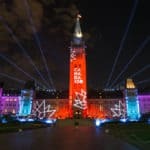 Since that time, Story – or Totem – Poles have been raised here. 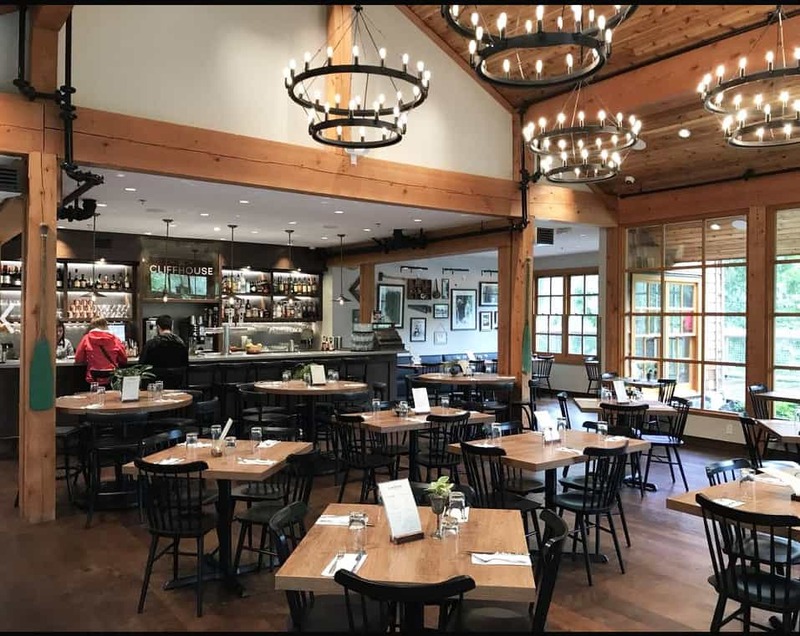 All this adventure can work up an appetite, and there are several restaurants in the Park that serve everything from casual snacks to full seasonal menus. 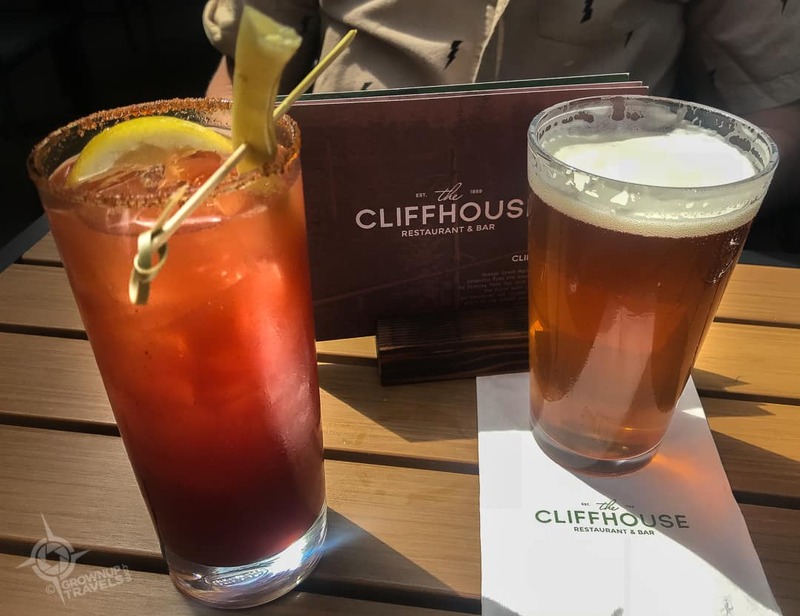 Henk and I decided to have a more grownup lunch at the new Cliff House Restaurant, a beautifully designed building with a huge stone fireplace and modern cabin-inspired decor on the inside. Located directly above the CliffWalk, it also has a pretty stone patio where we opted to sit since it was such a beautiful day. Both Henk and I have to say we were very pleasantly surprised with the quality of the food (and we aren’t the only ones, according to these reviews). 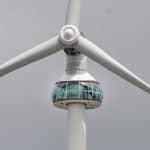 So often popular attractions like this take advantage of their ‘captive audience’ with overpriced food that is subpar, but this was definitely not the case here. Henk’s pulled pork burger and hand-cut fries were delicious and my fresh summer salad with grilled chicken, mango and cranberries was a perfect choice. And the service was as friendly as the food was delicious. 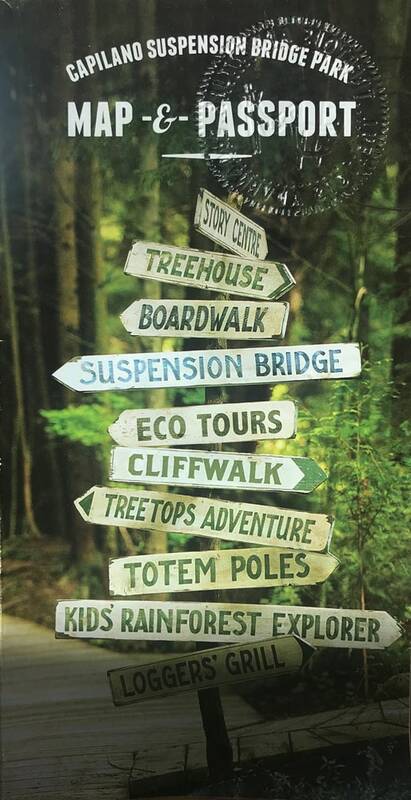 Like all of us, Capilano Suspension Bridge Park has changed a lot in 20 years. 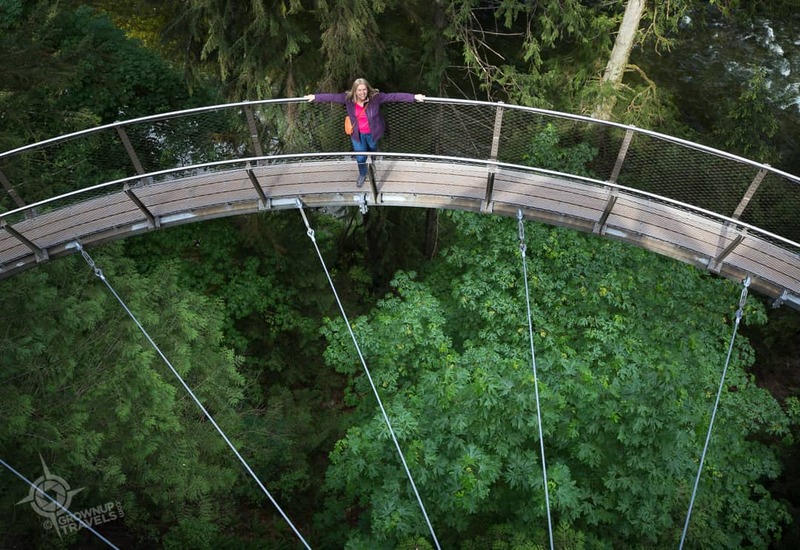 There’s still the same beautiful rainforest setting and iconic bridge that are the foundation of the Park, but with all the adventures and amenities that have been added since my first visit, the experience is even better than I remembered – and it’s easy to see why Capilano Park has become BC’s top destination attraction. 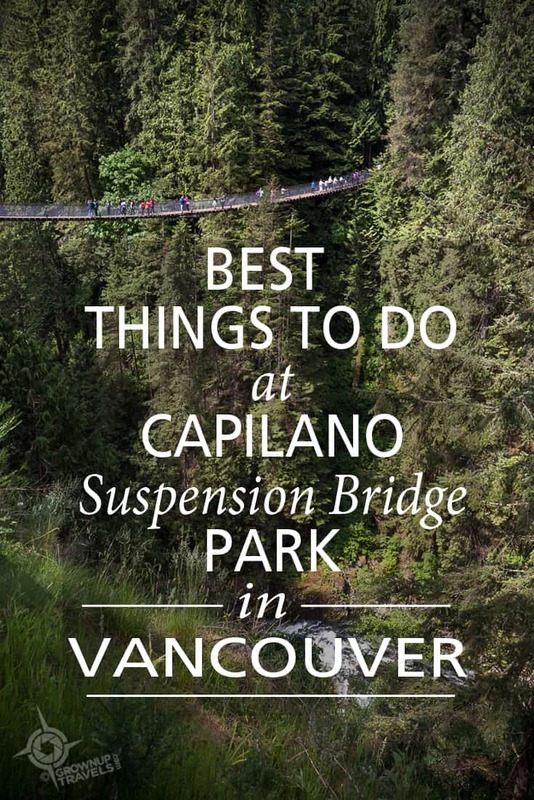 TIP: There are free shuttles that take visitors to Capilano Suspension Bridge Park from downtown Vancouver (although they are difficult to identify since they don’t have big signs or graphics). For the pickup points and schedule, check the website. Special thanks to Capilano Suspension Bridge Park, who hosted our visit with complimentary admission for Henk and I.